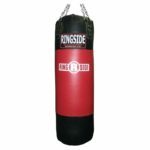 There are lots of questions like “What Size of Heavy Bag do I need?” on boxing or martial arts forums and there are also LOTS of heavy bag types on the market and getting one for your need requires some info. You will find all about the sizing of heavy bags in this short content. Also, there is a speed bag sizing guide at the end of the writing. Will You Kick it or will You Use it only for Boxing? First things first, this question changes a lot about the sizing and you may already know the rule which heavy bag’s weight should be half of your weight. Well, it applies when you get a punching bag for only punching. If you are looking for a heavy bag to do only punching without any kicks etc… then, 1/2 of the weight rule would be your way to go. For example, if you are 170 Ibs, then bags between 80 and 90 Ibs would be fine. These bags are generally shorter than 55″. You may also look for a punching bag to kick. This type of punching bags are taller and swing more than shorter heavy bags especially when you kick. These heavy bags are taller than 60″ and shouldn’t be flying after your kick. When it is the case, get bigger than half of your weight. So its swing will be optimal and also it will give you optimal resistance. For example if you weigh 180 Ibs, then 100 Ibs punching bags are perfect. I have been a fan of free standing bags for years. They are so easy to set up and provide lots of workout types. I have been doing boxing training with these type of bags for a long time and I come to a conclusion that you need to experiment. For example, Century Wavemaster XXL just gives too much resistance and I actually had to empty the bag around 20 Ibs for getting a high quality training. Some bags have different unique features like this and you can check them out on here. Also, after you train with one, according to your training quality you can fill or empty it. And when you get stronger, you might even add some weight. How to Choose Speed Bag Size? What is the best size speed bag for beginners? As you gain more experience and condition, you can choose smaller speed bags. With speed bag training, your shoulders will improve significantly and have incredible muscle tone. These are all sizing guides of bags for training. If you have any further questions, please leave a comment below. Hi! I love the idea of being able to add and remove weight according to your needs. I think it’s especially important considering that there may be different people within a household and they would have varying levels of fitness needs. Great post. As Kate said that the idea about adjusting the weight it’s just so practical. Me and my wife doing our own training sessions and that was always a problem for us. I will need to replace my current bag anyway so I will try one of recommended by you. I really like the free standing heavy bag and glad you have good experience with them. Does that big round base at the bottom of these types of bag get in the way when you box with it? Or kick with it? The base just looks so big, how much does it come out? I like the sizing measurements to go by you have in this post, it’s very helpful to determine which bag to choose. Some great advice you give yet again Furkan. Before you get a bag it is important to do the research like you say. There is no point in just going out and getting one, and then finding out that it is not the right one for you. I prefer the free standing ones. The hanging ones seem more of a hassle for me. I will have to check out your site further as to what ones are suitable for me. Thanks again. Hi Owain, I love free standing bags too. Some even provide precision and strength training and it is really beneficial for lots of people including me 😉 And as you said it is seriously easier to set it up too. I am also sure that you will see something you like.